Esl activities, winter wildlife viewing! Winter is still with us on the ESL Wilderness Ranch. Our language students woke up this morning to a fresh covering of snow but clear sunny skies and plenty of new opportunities for esl activities! Language school took to the outside and turned into an impromptu photography session and of course new English vocabulary with strange words such as snowball fights and snow angels. Many of our language students come from areas that see very little snow, or snow that turns into brown mush in cities. Once again, our language school had something special to offer our students! As an extra bonus for our language students today we had a fresh dump of snow here at the ESL Wilderness Ranch and we went out to look for new animal tracks, a great addition to our esl activities. We were lucky and found some fresh Pine Martin prints that led us to a tree where the little guy was sitting on a branch looking at us. 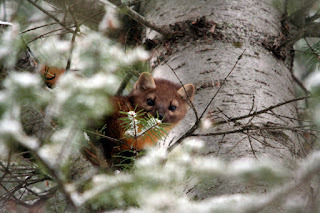 As part of our reading and comprehension skills, the students read articles on all the wildlife in the area so actually being able to see a Pine Martin quite close was really the highlight of the day.